Automobile manufacturers are some of the biggest brand advertisers in the world, and increasingly they are turning to mobile advertising to reach potential consumers. Greystripe – one of the biggest mobile ad networks in the US – has released the results of a survey of touch-smartphone owners to see how well the mobile channel works for this category. The purpose of the study was to provide insight into the users of touch-based smartphones, specifically iPhone, iPod Touch, and Android. The study was conducted during Q4 2010 and Q1 2011. 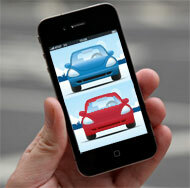 The first part of the study examined how people might use their smartphone during the process of buying an automobile. 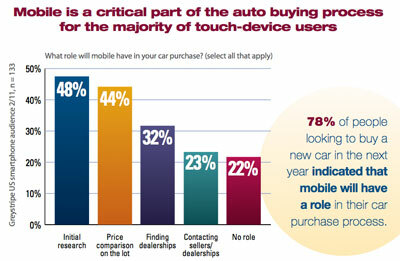 Overall, over three quarters of the people looking to buy a new car within the coming year said that their mobile would play a role in the purchase process. This role can vary from product research to price comparison to locating the closest dealer. smartphone owners consider both domestic and foreign cars almost equally. You can download the Greystipe report here.